An extremely easy appetizer that looks magnificent! Depending on your entertaining style, this recipe can easily be doubled. 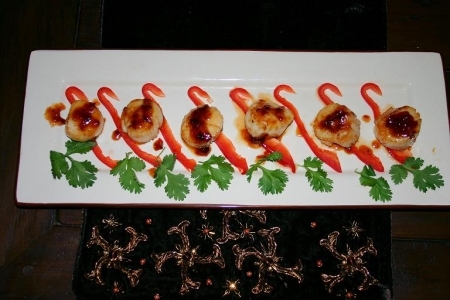 If one is using many courses, usually plan on one or two scallops per person as an appetizer. It is a great entrée too! If making as an entrée round out the meal with Orange Bell Pepper Rice, Asian Style Rice or Rice Noodles with Asian Vegetables and Pea Shoots. Arrange sliced pepper and cilantro leaves on a serving dish. Thoroughly rinse each scallop and then place on a clean dish towel or paper towel and blot to dry. Scallops will cook/sear better if they are dry. Lightly sprinkle scallops with kosher salt and fresh cracked pepper. In a medium sized skillet, heat toasted sesame oil over medium high heat. Once skillet is hot place each scallop in the skillet. Cook each side for 3-4 minutes or until a nice golden brown. Once each side is seared, add the sweet chili sauce to coat. Cover and let cook for 2 more minutes. Remove scallops and place onto serving dish, serve immediately and enjoy! Try Graf v. Schönborn Riesling Kabinett Troken Hallburger Schlossberg, McManis Family Vineyards Viognier (California), Yalumba Viognier (South Australia), Tsingtao, Asahi or Sapporo.